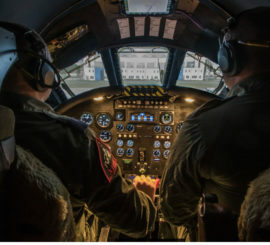 Try to imagine this – your instructor is sitting in the back seat, you and a collegue are sat at the controls ready to take an 80 ton, 250mph airliner into the air with just a little back seat advice from your instructor! You will complete a full circuit of a major airport before attempting to bring the aircraft back in to land again. For more information read below. 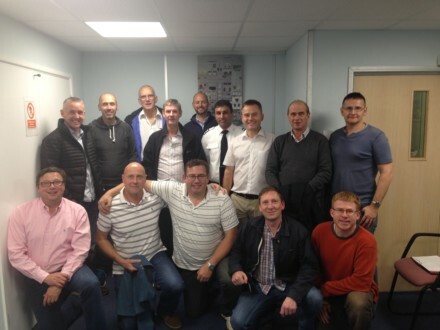 Upon arrival you will be met by one of our fully qualified, commercial pilot instructors. 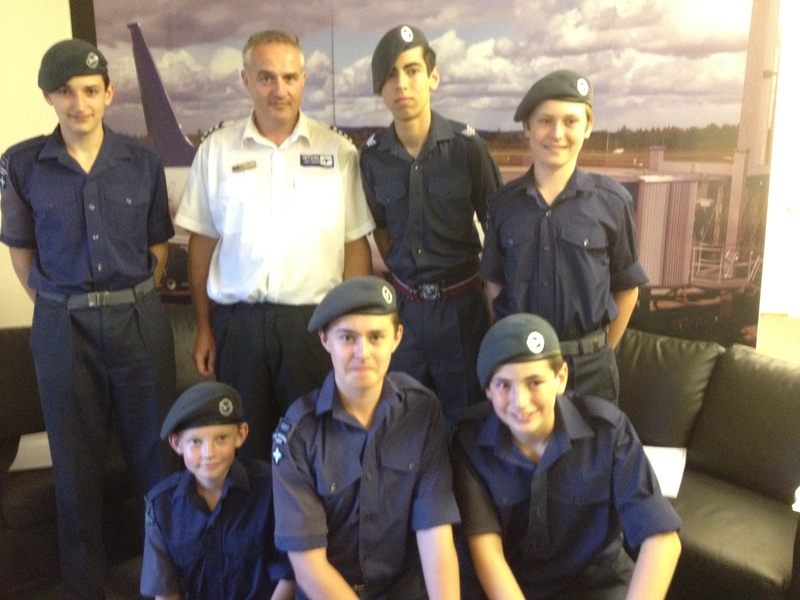 Over refreshments they will give your group a brief overview of how the session works a safety briefing followed by a more in-depth 20 minute briefing on how to fly the Boeing 737 800 aircraft, hopefully with crashing or getting lost! You will also have a chance to select from over 24,000 airports around the world that you want the virtual session to be based at. 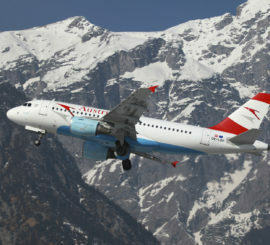 Some favourites are, JFK, Hong Kong Kai Tak, London Heathrow, Las Vegas and Dubai, but the choice is yours. Although not compulsory we always find the best sessions are those with a bit of friendly competition. 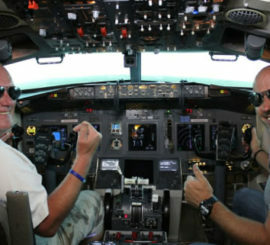 Our instructors mark each pilot on such criteria as, accuracy, not getting lost and being able to land on the runway. At the end of the session the marks are tallied up and a small prize if presented by our instructor. If a member of your group has some real flying experience you should inform the instructor who will add a handicap based on experience to keep it all fair. To give each pilot the maximum time at the controls the instructor now sits in the jump seat which is directly behind the captains seat where he will offer gentle advise! 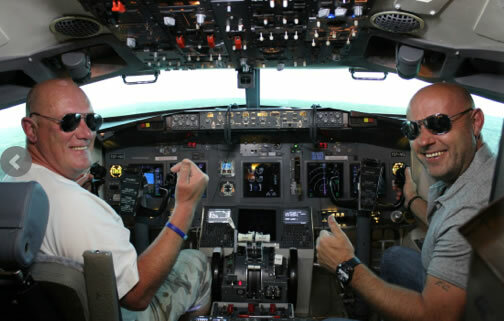 Each pilot then gets a chance to both fly as pilot in control as well as co pilot, or navigator where they will help operate the many buttons and levers needed to operate the Boeing 737 as well as help the pilot flying not to get lost. This means two people in the group are in the front of the aircraft at any one time giving maximum time at the controls. 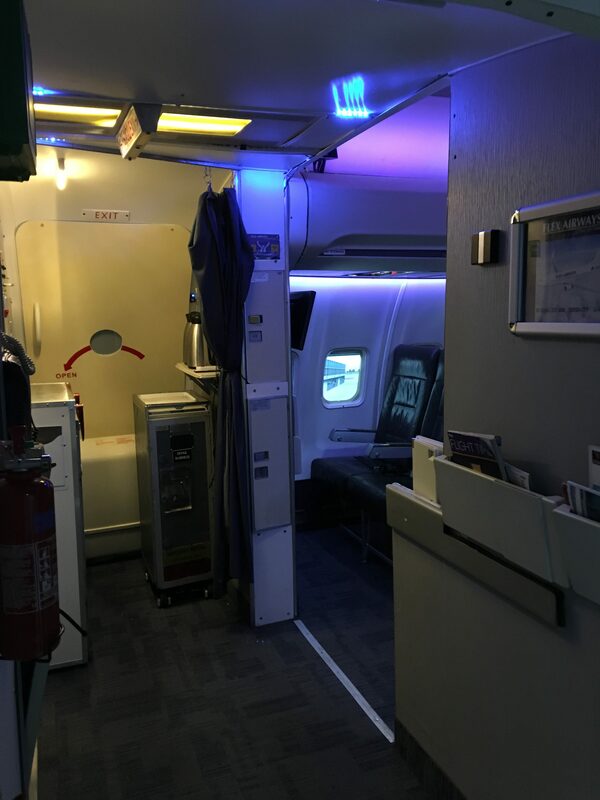 Shoreham, Manchester and Sywell simulators have mock cabins so you can relax in a real aircraft environment, perhaps you can even get your boss to act as cabin crew and supply the coffees on our real cabin trolleys…! Films are usually £25.00 but for group bookings this is reduced to £20 per film for those that want a keep sake of their epic flight. This simply MUST HAVE Addition to your experience producing a keep sake you will spend hours watching and re watching, time and again! We have positioned 3 HD cameras in our cockpit to capture every second of your flight experience. From the moment you strap yourself in we start recording from 3 different angles. 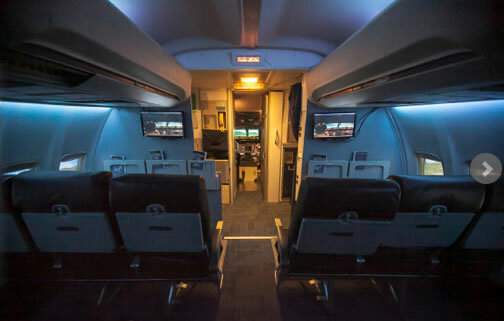 Rearward Facing – to capture your expressions throughout the experience. Our headsets also capture every sound and discussion held in the cockpit. At the end of the session you will receive a USB drive in our branded gift wallet to immediately take away. THIS IS A SIMPLY MUST HAVE ADD-ON ! Ever wondered how to start and prepare an airliner for departure? Or want to taxi to the runway? 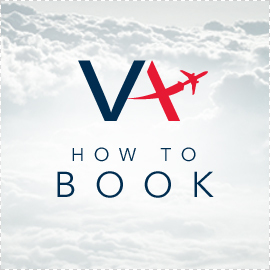 For just £25.00 extra you can add this MUST HAVE 15 minute add-on to your session and really get that full airline experience. Once your briefing is complete you will enter the cockpit to find it completely shutdown and parked at the Gate – or cold and dark as we describe it, this is how real pilots find it when they turn up for the first flight of the day. Guided by your instructor you will slowly bring the aircraft to life, you will follow real world checklists, program the flight computer and prepare the aircraft for flight. 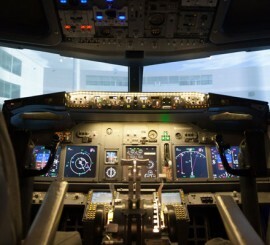 You will then be pushed back from the gate, start the engines and configure the cockpit for taxi. With both engines started and the pushback truck out of the way you will taxi the aircraft to the holding point at the runway. With final checks complete and lined up on the runway you are ready for your session time to begin. This add on is a MUST HAVE addition to all our flight simulator experiences. The level of realism this adds cannot be underestimated totally immersing you in the world of the big jet pilot.